//Okay, SSID IE is ready for appending. //CreatePacket returns a beacon, we will also send out directd probe responses. 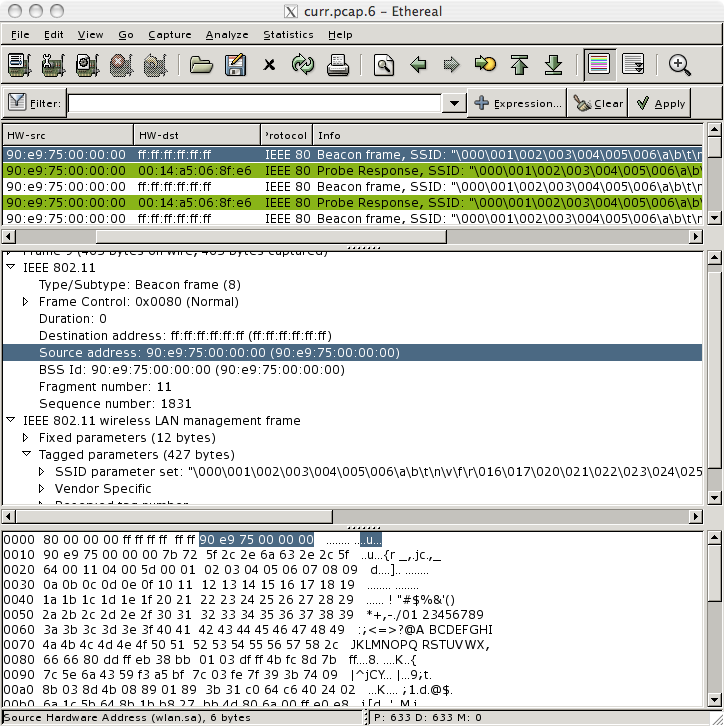 ProbePacket.wlan_header->subtype = 5; //probe response. f6e713de f680d131000002  test    byte ptr [eax+31D1h],2     ds:0023:ccccfe9d=?? In this case, the crash occurred because a variable on the stack was overwritten that was subsequently used as a pointer. This overwritten pointer was then dereferenced. In this case, the dereference occurred through the eax register. Although the crash occurred as a result of the dereference, it's important to note that the return address for the stack frame was successfully overwritten with a controlled value of 0xcccccccc. If the function had been allowed to return cleanly without trying to dereference corrupted pointers, full control of the instruction pointer would have been obtained. In order to avoid this crash and gain full control of the instruction pointer, it's necessary to try to calculate the offset of the return address from the start of the buffer that is being transmitted. Figuring out this offset also has the benefit of making it possible to figure out the minimum number of bytes necessary to transmit to trigger the overflow. This is important because it may be useful when it comes to preventing the dereference crash that was seen previously. From this stack trace, it can be seen that the return address was overwritten with 0x5c5b5a59. Since byte-ordering on x86 is little endian, the offset within the buffer that contains the SSID is 0x59. With knowledge of the offset at which the return address is overwritten, the next step becomes figuring out where in the buffer to place the arbitrary code that will be executed. Before going down this route, it's important to provide a little bit of background on the format of 802.11 Management packets. Management packets encode all of their information in what the standard calls Information Elements (IEs). IEs have a one byte identifier followed by a one byte length which is subsequently followed by the associated IE data. For those familiar with Type-Length-Value (TLV), IEs are roughly the same thing. Based on this definition, the largest possible IE is 257 bytes (2 bytes of overhead, and 255 bytes of data). 805500b8  82 84 8b 96 24 30 48 6c-0c 12 18 60 44 00 55 80  ....$0Hl...`D.U. 80550188  fd fe e9 84 00 00 00 00-e0 9e 6a 01 ac 01 55 80  ..........j...U. Based on this dump, it appears that the majority of the SSID was indeed copied across the stack. However, a large portion of the buffer prior to the offset of the return address has been mangled. In this instance, the return address appears to be located at 0x805500e4. While the area prior to this address appears mangled, the area succeeding it has remained intact. |               |    \_ Can hold at most 163 bytes of arbitrary code. \_ Start of SSID that is mangled after the overflow occurs. Transmitting a buffer that is structured as shown above does indeed result in a bluescreen. It is possible to differentiate actual crashes from those generated as the result of an int3 by looking at the bugcheck information. The use of an int3 will result in an unhandled kernel mode exception which is bugcheck code 0x8e. Furthermore, the exception code information associated with this (the first parameter of the exception) will be set to 0x80000003. Exception code 0x80000003 is used to indicate that the unhandled exception was associated with a trap instruction. This is generally a good indication that the arbitrary code you specified has executed. It's also very useful in situations where it is not possible to do remote kernel debugging and one must rely on strictly using crash dump analysis. The above crash dump information definitely shows that arbitrary code execution has been achieved. This is a big milestone. It pretty much proves that exploitation will be possible. However, it doesn't prove how reliable or portable it will be. For that reason, the next step involves identifying changes to the exploit that will make it more reliable and portable from one machine to the next. Fortunately, the current situation already appears like it might afford a good degree of portability, as the stack addresses don't appear to shift around from one crash to the next. At this stage, the return address is being overwritten with a hard-coded stack address that points immediately after the return address in the buffer. One of the problems with this is that the amount of space immediately following the return address is limited to 163 bytes due to the maximum size of the SSID IE. This is enough room for small stub of a payload, but probably not large enough for a payload that would provide anything interesting in terms of features. It's also worth noting that overwriting past the return address might overwrite some important elements on the stack that could lead to the system crashing at some later point for hard to explain reasons. When dealing with kernel-mode vulnerabilities, it is advised that one attempt to clobber the least amount of state as possible in order to reduce the amount of collateral damage that might ensue. Limiting the amount of data that is used in the overflow to only the amount needed to trigger the overwriting of the return address means that the total size for the SSID IE will be limited and not suitable to hold arbitrary code. However, there's no reason why code couldn't be placed in a completely separate IE unrelated to the SSID. This means we could transmit a packet that included both the bogus SSID IE and another arbitrary IE which would be used to contain the arbitrary code. Although this would work, it must be possible to find a reference to the arbitrary IE that contains the arbitrary code. One approach that might be taken to do this would be to search the address space for an intact copy of the 802.11 packet that is transmitted. Before going down that path, it makes sense to try to find instances of the packet in memory using the kernel debugger. A simple search of the address space using the destination MAC address of the packet sent is a good way to find potential matches. In this case, the destination MAC is 00:14:a5:06:8f:e6. 84efdecc  00 14 a5 06 8f e6 00 00-65 00 00 00 16 00 25 0a  ........e.....%. 84223048  00 ff 4a 0d 01 55 80 0d-01 55 80 0d 01 55 80 0d  ..J..U...U...U..
84223058  01 55 80 0d 01 55 80 0d-01 55 80 0d 01 55 80 0d  .U...U...U...U..
84223068  01 55 80 0d 01 55 80 0d-01 55 80 0d 01 55 80 0d  .U...U...U...U..
84223078  01 55 80 0d 01 55 80 0d-01 55 80 0d 01 55 80 0d  .U...U...U...U..
84223088  01 55 80 0d 01 55 80 0d-01 55 80 0d 01 55 80 0d  .U...U...U...U..
84223098  01 55 80 0d 01 55 80 0d-01 55 80 0d 01 55 80 0d  .U...U...U...U..
Inspecting each of these registers individually eventually shows that the edi register is pointing into a copy of the packet. As chance would have it, edi is pointing to the source MAC in the 802.11 packet that was sent. If it had instead been pointing to the destination MAC or the end of the packet, it would not have been of any use. With edi being pointed to the source MAC, the rest of the cards fall into place. The hard-coded stack address that was previously used to overwrite the return address can be replaced with an address (probably inside ntoskrnl.exe) that contains the equivalent of a jmp edi instruction. When the exploit is triggered and the vulnerable function returns, it will transfer control to the location that contains the jmp edi. The jmp edi, in turn, transfers control to the first byte of the source MAC. By setting the source MAC to some executable code, such as a relative jump instruction, it is possible to finally transfer control into a location of the packet that contains the arbitrary code that should be executed. 806590ca  ff e7 ff 5f eb 05 bb 22-00 00 c0 8b ce e8 74 ff  ..._..."......t.
With the exploit all but finished, the final question that remains unanswered is where the arbitrary code should be placed in the 802.11 packet. There are a few different ways that this could be tackled. The simplest solution to the problem would be to simply append the arbitrary code immediately after the SSID in the packet. However, this would make the packet malformed and might cause the driver to drop it. Alternatively, an arbitrary IE, such as a WPA IE, could be used as a container for the arbitrary code as suggested earlier in this section. For now, the authors decided to take the middle road. By default, a WPA IE will be used as the container for all payloads, regardless of whether or not the payloads fit within the IE. This has the effect of allowing all payloads smaller than 256 bytes to be part of a well-formed packet. Payloads that are larger than 255 bytes will cause the packet to be malformed, but perhaps not enough to cause the driver to drop the packet. An alternate solution to this issue can be found in the NetGear case study.